We are a family run Business based in Bridgend, South Wales with 30 yrs experience in the marine Trade. We are only 20 mins from Cardiff & 20 mins from Swansea ! ( 1mile off J36 M4 ). 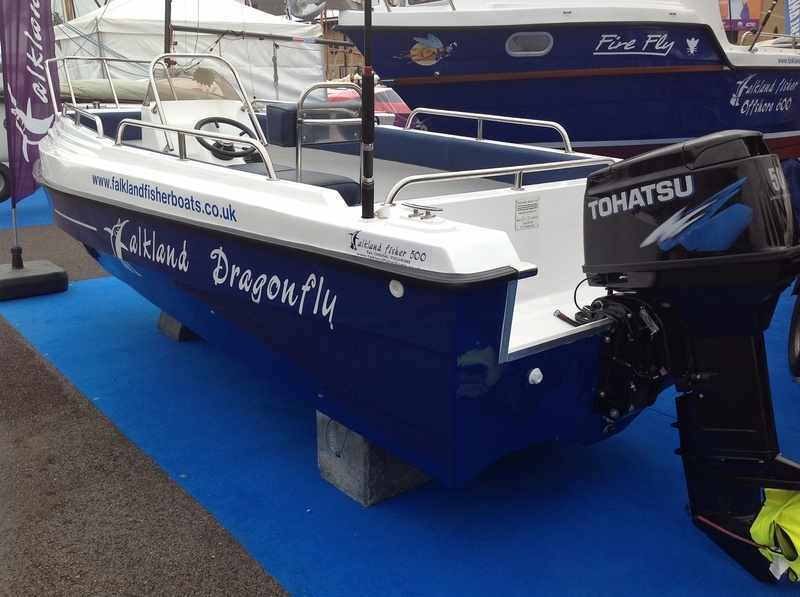 We are Builders of the successful Falkland Fisher and Falkland Premier Range of Performance Angling Boats, the Superb Shuttle Rib Range of Performance Rigid Inflatable Boats and the Dragonfly open sports fisher the ideal salt or freshwater flyfishing boat ! 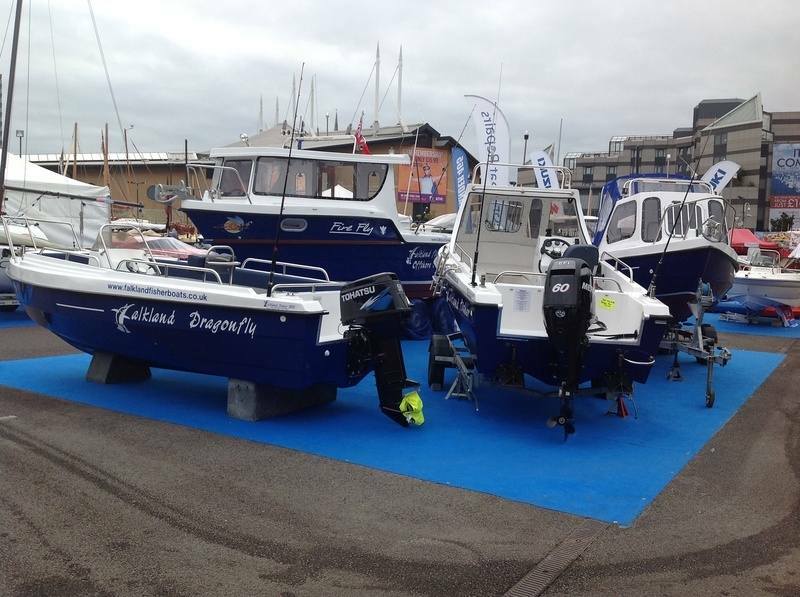 We are also a "Sea fish" approved Commercial boat building yard and full members of the British Marine Federation. We Build Boats & Packages to suit your Requirements , by offering a totally bespoke service at GREAT PRICES. CARDIFF BAY, WALES - ON TEST IN A SHUTTLE 550. IT'S PERFORMANCE EXCEEDED OUR EXPECTATIONS ! Falkland Fast Fishing boats and Premier Day Cruisers have one of the best designed Hulls on the market. Planing ability at low speeds with a supersoft dry ride and unrivalled stability,makes the Falkland Fisher the ideal choice when buying your boat. A Falkland Offshore 600 on it's way to a customer in West Sussex , England ! Our latest model - The DRAGONFLY 500 open sports fisher. A great allrounder - whether skiing , diving ,fishing or just generally cruising with family and friends. This is an ideal Bass Boat giving all the handling and performance of the Falkland Fisher , but with unrestricted space !! It's a great platform for the dedicated sports angler to fish from, whether saltwater flyfishing or simply drifting a live sandeel across a sandbar ! NB: We are committed to continuously improving the build quality and hardware on each boat produced. ORDER TODAY AND GET A BARGAIN ! 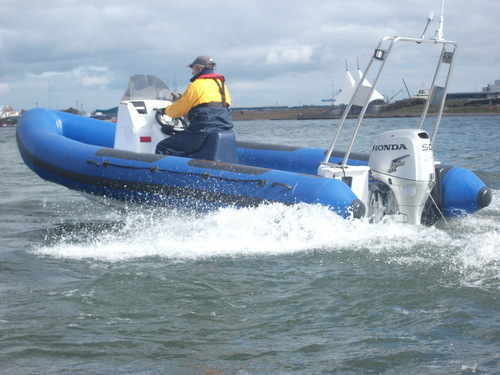 Why not Part Exchange your old boat for a Brand New Falkland Fisher / Premier / Dragonfly OR Shuttle Rib ! Order Your Falkland Package NOW ! Used Falkland Fishers also wanted! THEY HAVE OUTSTANDING SEAWORTHINESS DUE TO A PERFORMANCE DESIGNED HULL,WHICH IS TRIED AND TESTED.THEY ARE APPROVED FOR USE IN THE COMMERCIAL FISHING INDUSTRY WITH SEAFISH APPROVAL ON LAYUP AND HULL CONFIGURATION. THEY ARE PROBABLY THE BEST SMALL ANGLING CRAFT ON THE MARKET TODAY! EASY TO LAUNCH AND RETRIEVE, THE FALKLAND FISHER RANGE OF BOATS ARE THE NO 1 CHOICE FOR SERIOUS ANGLERS OR FAMILIES AT A PRICE YOU REALLY CAN AFFORD ! SOME GOOD REASONS WHY YOU SHOULD BUY A FALKLAND BOAT OR RIB. *Renowned for our unique, performance shallow draft hull design which incorporates a sharp vee bow entry and a gull wing hull configuration at the stern , giving exceptional lateral stablity , a dry , smooth ride with high performance on the plane and at anchor or just drifting . *Unrivalled Performance and Seakeeping Qualities. * Great in a short choppy sea or large rolling swells. * Made in the UK by Skilled Tradesmen , using only the latest Quality Lloyds of London approved materials in the construction. * Our fixtures and fittings are generally accepted as being some of the best in our class of boats.They are far superior to our competitors as they are all custom made specifically for our range of boats . If in doubt , - See for yourself !! *As we manufacture the boats at our factory in a controlled environment, we can closely monitor build quality unlike some of our competitors who have their boats made outside Europe and bring them in to the country in containers hoping that they've been built to western European standards!! *UK based company offering a professional support service anywhere in the UK, Ireland and the rest of Europe. * Heavy layup as standard incorporating an oak keel and full hull length floor bearers, all of which are completely encapsulated in glassfibre for total protection. *This system, combined with the addition of closed cell polyeurethane foam buoyancy, imparts exceptional lateral & longitudinal strength into the hull superstructure. *Falkland Fisher boats and Shuttle Ribs are constructed using only Lloyds of London approved marine grade resins and NPG gelcoats . *UK Manufactured Quality Marine grade 316 stainless steel rails and fittings as standard, designed and produced specifically for an optimum fit, unlike many boatbuilders today who choose cheap, standard sized inferior imports to maximise profits .These not only look poor they're made poor! *Exceptional value for money - "a quality boat at a quality price"
* Bespoke service ensuring that YOU get what YOU want as YOU want it. * A 3year structural guarantee on all Falkland Fisher and Premier Hulls . A 2 year structural guarantee on all Falkland Shuttle rib models .The 500 series Boats conform to CE category c and are recommended for inshore use for up to 4 anglers. The 600 series , up to 6 anglers and the Shuttle RIB 550 is recommended for up to 8 persons.We have teamed up with Extreme and Indespension Trailer Companies to create , what we think , is the right Trailer for your chosen Falkland ! NB; Any other Branded or " altered " trailer will invalidate any warranty - so please consider this when purchasing ! 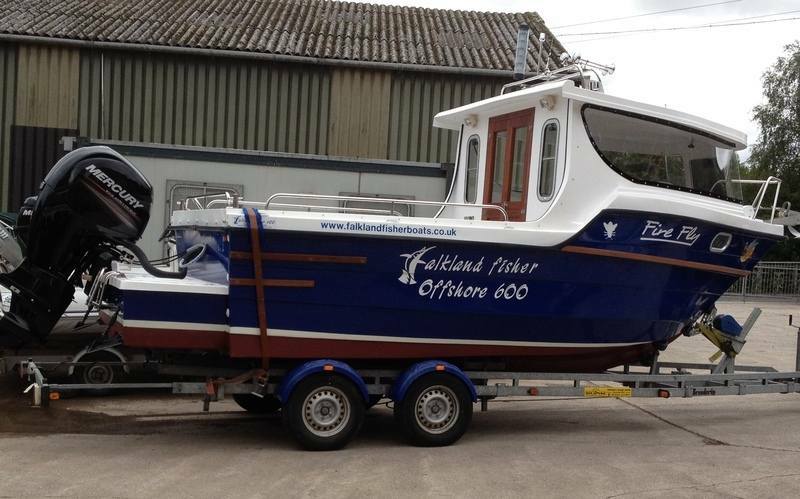 *Falkland boats pride ourselves on the Build quality and service we offer to you,our customers. FOR ALL BOAT REPAIR ENQUIRIES PLEASE Visit www.ggfboatrepairs.co.uk for COMPREHENSIVE INFO on the services we offer to the Marine Trade and General Public . Opening times mon-fri 8.30am.-5pm Saturday's by prior arrangement. Professional UK & European Marine Shops or Distributors are cordially invited to apply to become an agent for Falkland Fisher Boats AND Shuttle Ribs in their respective Region(s).